Oh gosh you guys…I don’t know if I’ve ever loved a recipe more. After being completely inspired by Alison Roman’s “The Stew“, I decided to look in my pantry and create something similar. 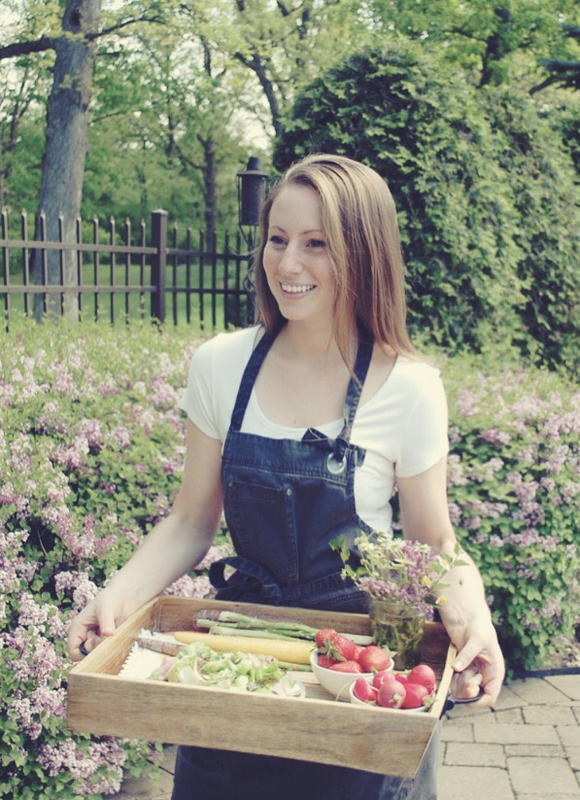 What caught my eye of her dish was the bright, vibrant yellow color and the absolutely stunning garnishes on top. 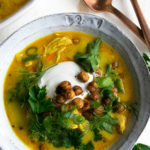 Alison’s recipe is quite different, using chickpeas as a hearty base within the stew. 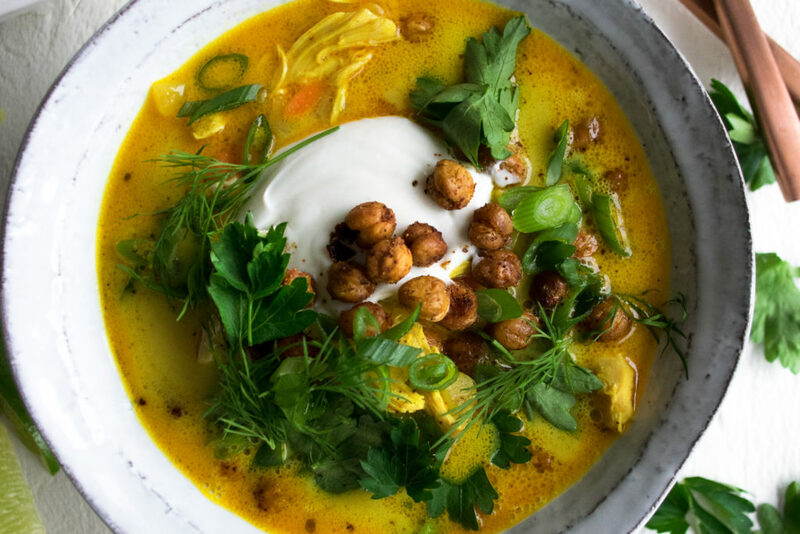 My version is more of a chicken soup, with bold spices, carrots for some more texture, creamy coconut milk, and ALL the garnishes. I’ve also roasted some chickpeas with more spices and am using them as a crispy element on top. It is exceptionally good. And the biggest secret is adding lots and lots of fresh herbs on top. And not just a little sprinkling of chopped parsley… I’m talking a generous handful of whole parsley leaves and fresh dill. Trust me, don’t skip this very crucial step. They blend right into the soup and add so much wonderful flavor. 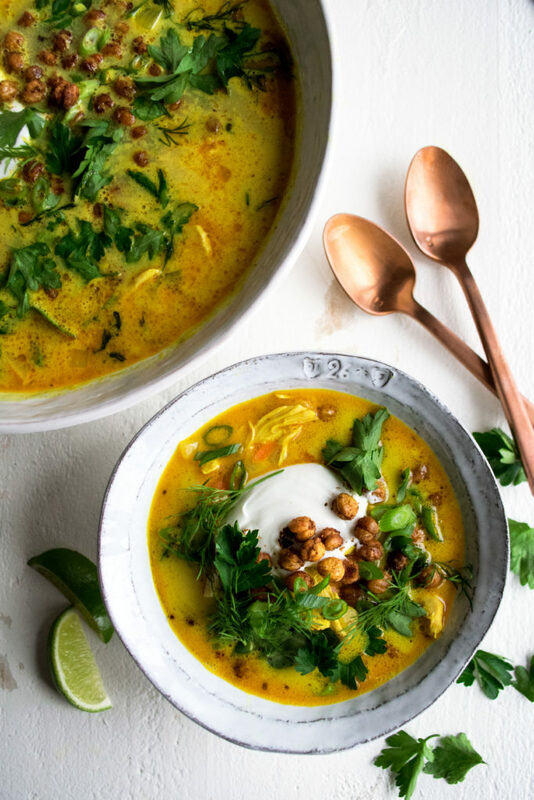 This turmeric coconut chicken soup has quickly become a staple in my kitchen. 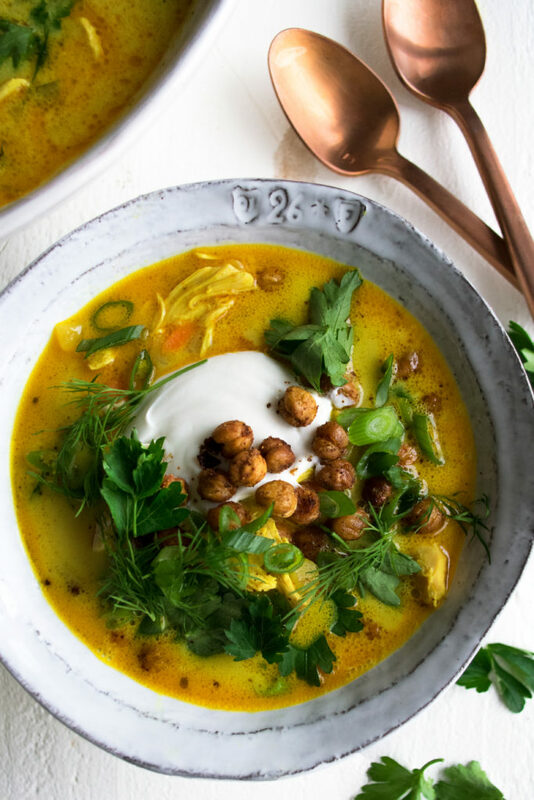 It uses mainly pantry ingredients, comes together rather effortlessly, is incredibly healthy yet intoxicatingly delicious, tastes warm and soothing, and makes for the best leftovers (just keep the garnishes separate, heat up the soup in a small saucepan, and then garnish right before eating). What more could you ask for?! My ideal meal would include this rustic winter salad alongside the soup as well! When I created this recipe, I had some leftover roasted chicken (both white and dark meat with the skin on) laying around, so I peeled off the skin and shredded it up for the soup. It’s the PERFECT recipe to use up any leftover roasted chicken you have, or you can alternatively just roast the chicken fresh and shred it for the soup. I prefer skin-on, bone-in chicken so that it has lots of flavor when it roasts. You can also add a pound of raw chicken to the soup as it’s simmering and let the chicken cook right in the soup. When it’s cooked through, pull out the chicken, shred it, and add it back in. While I much prefer the flavor of the roasted chicken, this method does work, too! This looks just darn delightful! Oh it really is! So soothing and perfect for winter weeknight meals. Thanks Rachel! !